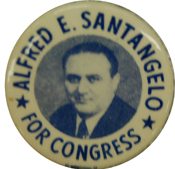 SANTANGELO, Alfred Edward, a Representative from New York; born in New York City June 4, 1912; attended public schools; A.B., City College of New York, 1935; LL.B, Columbia University School of Law, 1938; admitted to the New York bar in 1939 and commenced practice in New York City; assistant district attorney, 1945; New York State senator, 1947-1950 and 1953-1956; elected as a Democrat to the Eighty-fifth and to the two succeeding Congresses (January 3, 1957-January 3, 1963); unsuccessful candidate for reelection in 1962 to the Eighty-eighth Congress; resumed the practice of law; delegate to New York State Constitutional convention, 1967; resided in Bronx, N.Y.; died in Orlando, Fla., March 30, 1978; interment in Calvary Cemetery, Woodside, N.Y.
Santangelo, Betty L. Lucky Corner: The Biography of Congressman Alfred E. Santangelo and the Rise of Italian-Americans in Politics. Editors: Patricia A. Santangelo and Charles Alfred Santangelo. New York: Center for Migration Studies, 1999.